A couple from Chesterton, who have just moved in about a year ago to be near their grandchildren, claimed an $18.7 million jackpot from the Hoosier Lottery. 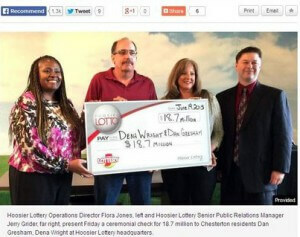 Dena Wright and Dan Gresham had the only ticket which matched all numbers drawn last June 13. While Wright wants to continue working as a real estate agent, Gresham has already given his notice at his mechanic job. The winners later chose to receive the full amount spread over a 30 year period.